On Tuesday, October 30, Parkway Central Library’s Skyline Room was abuzz with the cheers of sixth graders, the sound of buzzers and music, and the roar of applause. The cause? A "Book Battle," a Jeopardy-style literature trivia competition that tested students’ knowledge and understanding of a book that they’d all been reading since the start of this school year: The Skin I’m In, by Sharon Flake. In addition to these three competing sixth grade classes from James R. Ludlow Elementary, Chester A. Arthur School, and Girard College School, the Free Library of Philadelphia welcomed author and Philadelphia native Sharon G. Flake back to celebrate the 20th anniversary of her award-winning debut novel, The Skin I’m In, first published in 1998. Ms. Flake kicked off the Book Battle event by greeting and taking photos with each class before they got right to the competition. Each class had been preparing for the day for weeks with the help of their teachers and Free Library LEAP Teen Specialist Khyra Lammers, who visited their classrooms throughout the fall to help guide their reading and prepare them for the kind of critical-thinking questions and literature trivia they would encounter during the Book Battle. Although all three competing schools were well-prepared and enthusiastic, after two full rounds and a Final Jeopardy-style question posed to all three teams, the sixth graders from Girard College won the day, taking home a custom Book Battle trophy. They weren’t the only winners, though: every student from all three classes took home a giveaway book, Free Library backpack, and had the opportunity to have Ms. Flake personally sign their copy of The Skin I’m In. Ms. Flake, who received the Children’s Literature Citation at the Pennsylvania Library Association Conference in 2017, has never attended a Book Battle event like this one, and shared with Free Library staff how meaningful it was for her to see so many young people engaging with her work. 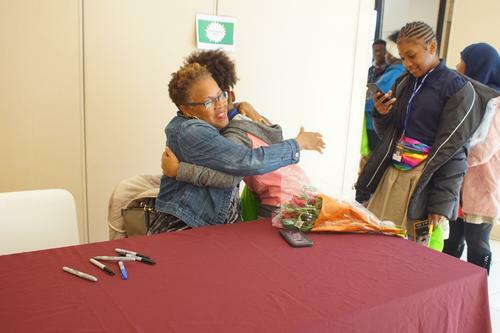 Most notably, she was pleasantly surprised when a student ran up to her and hugged her, exclaiming "This is the best day of my life!" Teachers, too, were pleased with the experience. In a follow-up survey, one participating teacher shared, "I would rate my satisfaction with the event as a 10! Giving students the chance to meet the author was an amazing experience! The book battle itself was a great time!" Events like this one are just some of the many ways that the Free Library seeks to engage school-aged students and their teachers in exciting, hands-on literacy experiences. To learn more about resources to support your child’s classroom or to connect your school/class with the Free Library, visit our School Partnerships page or email us at schools@freelibrary.org. 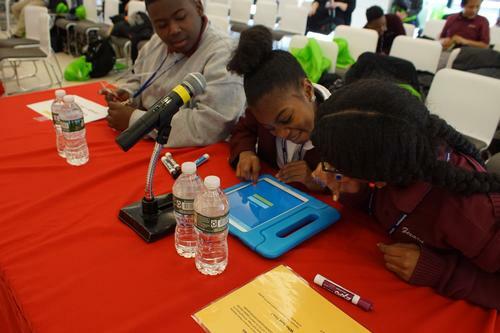 Teams of sixth graders from three Philadelphia schools used iPads to buzz in and answer literature questions. Author Sharon Flake met with and signed books for all Book Battle attendees! The 6th grade class from Girard College took home this year's Book Battle trophy. Add a Comment to This Sixth Grade "Battle" Was One for the Books!